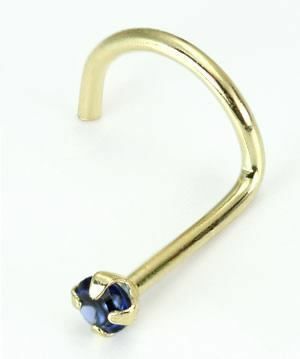 20g 14kt Yellow Gold 2mm Sapphire Jewel Nose SCREW 20g with inner diameter of 6mm 20g is .80mm, which will fit perfectly in an 18g nose piercing. The Gem is set on this so it actually lays flat on your nose. Its a martini glass shape. It won't stick up and out like most others on the market.